Ok, so first of all, were you missing Zee? I know I was. We get Zee. Stuff with the fae get interesting, and we get some heavy hints about level of power some of Mercy's fae associates possess that have been kept well tamped down before. I have to say, vampire power-games have nothing on those of the fae. Things haven't quite settled down with the pack in regards to Mercy's role. After all, she has been instrumental in some rather significant upsets. But she and Adam are done with leniency. It's taken quite a few books to get to this point, but the books generally take place over relatively short periods of time... and it is at the very least politic to try and not use the nuclear option to solve problems. Fire Touched brings together many characters and elements that have built up through the previous books. Alliances, alienation, politics, and sacrifice come solidly into play. 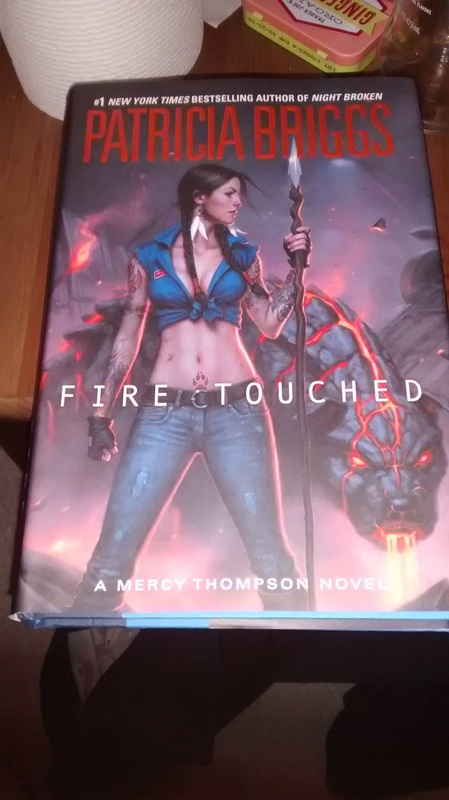 A great continuation of Mercy's story, and one that leaves me eagerly waiting for the next chapter. Advance Reader Copy courtesy of Ace (Penguin RandomHouse) in exchange for an honest review; changes may exist between galley and the final edition.